ROME (CNS) — Italy’s Mount Etna volcano began a new eruption the morning of Christmas Eve, triggering hundreds of small earthquakes and one, early Dec. 26, that damaged homes and churches nearby. Italy’s civil protection service reported no deaths or serious injuries in the Sicilian towns surrounding the volcano, but dozens of families who fled their homes when the magnitude 4.8 quake hit just after 3 a.m. Dec. 26 were told by firefighters that the buildings were not safe to re-enter. 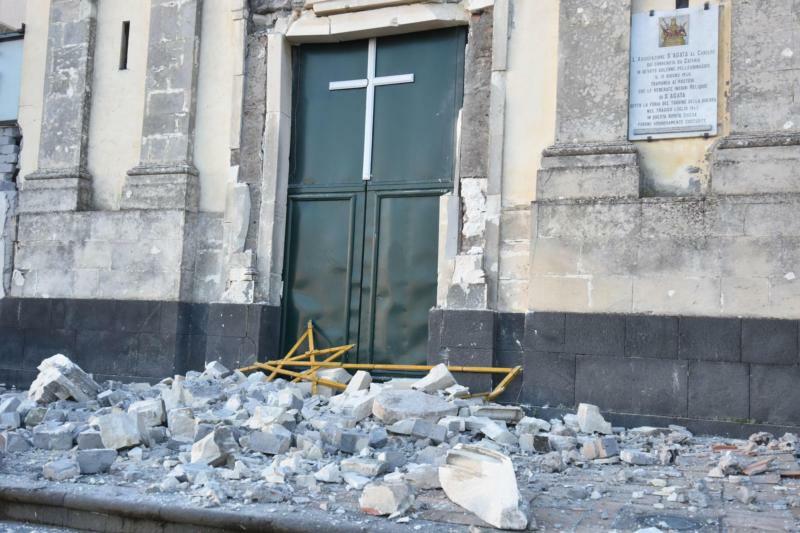 In the town of Pennisi, the bell tower of the Church of Blessed Mary of Carmel crashed down onto the rectory; the priest was able to get out of the house unharmed, Father Arturo Grasso, spokesman of the Diocese of Acireale, told Vatican News. Much of the news coverage throughout Europe mentioned how the earthquake toppled an outdoor statue of St. Emygdius in Pennisi. The third-century martyr, credited with saving a central Italian town from an earthquake in the 1700s, is now invoked throughout Italy as the patron saint for earthquake protection. In nearby Fleri, many of the buildings on the town’s main roads were damaged, including the Church of Blessed Mary of the Rosary, where chunks from the facade fell to the ground.